"The original portion of the Emmanuel Episcopal Church was erected on Water Street in 1881. The building was moved from Water Street to the north corner of Bryant and Main Streets in 1894, opposite the Common, to make way for the L.B. Evans Son shoe factory. The Andrew Young house, with two sheds and a barn, previously occupied the land at Bryant and Main Streets. In 1902, Mrs. James Clifton Pearson donated $10,000 to build the Parish House in memory of her husband, and in 1903, she donated an additional $8,000 to build the Rectory on Bryant Street. 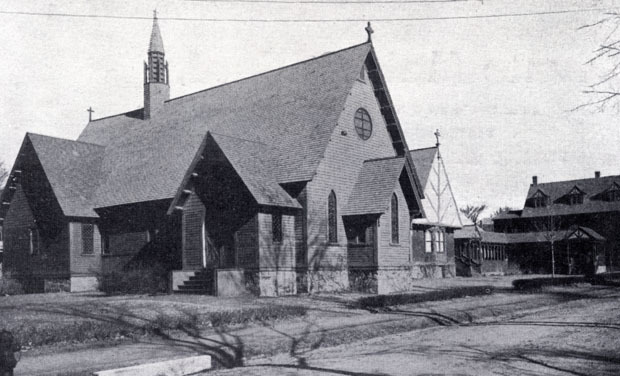 According to the Town's 250th anniversary publication, the Emmanuel Episcopal Church could trace its beginnings 'back 40 years or so, to the occasional servces held by Rev. William T. Smith, then rector of Christ's Church in Boston and Rev. Frederick S. Wiley, then rector of Christ's Church of New York, and a native of the Town.' A mission was formed in 1869, and on Easter 1870, the congregation organized itzelf into a parish which united with the diocese of Massachusetts the following year. Services were held in various rooms and halls for the next 10 years until the church edifice was erected at a cost of $5,000." - Text from calendar by Jayne M. D'Donofrio. “Emmanuel Episcopal Church, parish house and rectory, circa 1905,” NOBLE Digital Heritage, accessed April 20, 2019, https://digitalheritage.noblenet.org/noble/items/show/6934.